Finished in Windsor Cherry on select hardwoods and veneers. The off-white dial offers a convex glass crystal, polished brass-finished bezel, black Roman numerals and brass second hand. 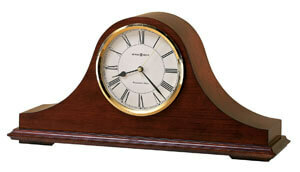 You will save $69.00 (27 %) on this Howard Miller Christopher 635-101.